At Jaguar St. Petersburg, we’ve always prided ourselves on providing the best car-buying experience that money can buy. Now, with our exclusive Express Checkout program, we’re taking it to the next level. It’s everything you already love about buying from Jaguar St. Petersburg — with an unparalleled degree of convenience. In fact, with Express Checkout you can select your vehicle and complete your offer entirely online. The same process that used to take hours can be finished in mere minutes. Not only will you save time, you also get a deal designed by you. Pick your payment, choose your financing and even receive an offer on your trade. Best yet, you’ll know your exact payment before you ever come to the dealership. Skip the hassle. Use Express Checkout today. Haggling over price, signing stacks of paper and wasting your time are now things of the past. Get the experience you deserve today. ✓ Select the vehicle of your dreams. ✓ Enter your information via our secure site. ✓ Customize financing to fit your needs perfectly. ✓ Value your trade and receive a highly competitive offer. ✓ Decide on your monthly payment. ✓ Our concierge service will have your vehicle cleaned, prepped and ready for your pickup at Jaguar St. Petersburg. Driving a Jaguar is truly an experience like no other — the way you buy yours should be no different. 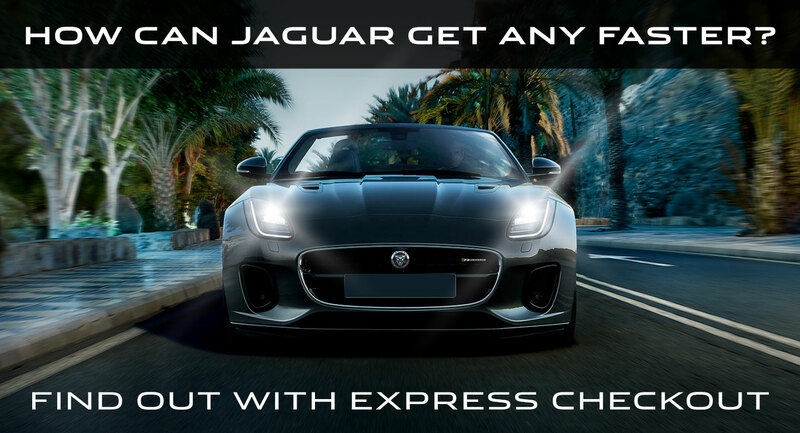 Get the experience you deserve with Express Checkout, only from Jaguar St. Petersburg.